UPCOMING RADIO EVENTS: MONDAY MAR 7 2-3PM KPFA-FM/94.1 AND MONDAY MAR 14 10-11AM KQED-FM/88.5. Please tune in for these upcoming radio events. Monday Mar. 7 2-3PM on KPFA-FM/94.1 I will be interviewed about adoption and attachment along with internationally renowned adoption expert, therapist and author of the adoption bible, The Primal Wound, Nancy Newton Verrier, on the show “About Health” hosted by Rona Renner, RN. You can also LISTEN LIVE on KPFA.org or listen to the archived show. Monday Mar. 14 10-11AM on KQED-FM/88.5 I will be on a panel discussion about survivors of suicide on the nationally syndicated “Forum,” hosted by Michael Krasny. You can also LISTEN LIVE on KQED.org or listen to the archived show. 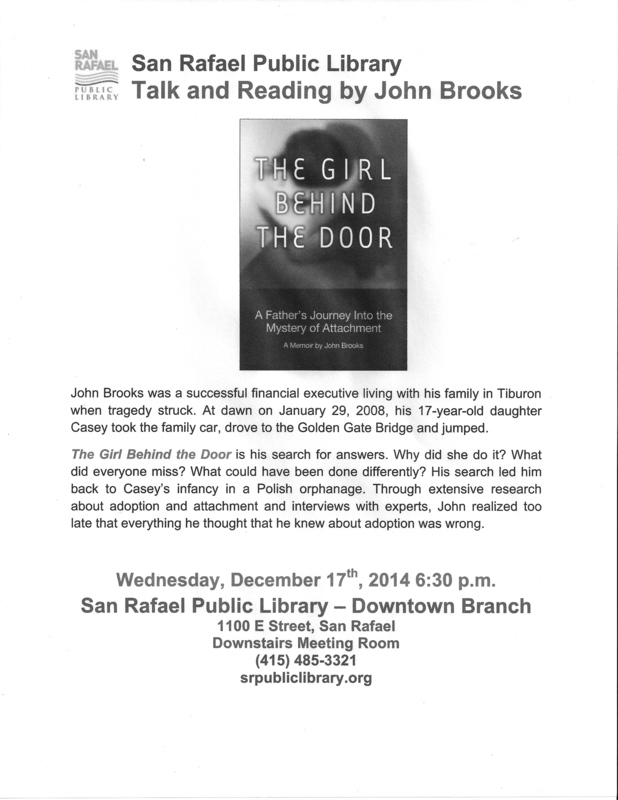 Join Me For My Next Author Event, San Rafael Downtown Public Library Wed Dec 17 @ 6:30P! Dear Friends and Neighbors – The San Rafael Public Library – Downtown Branch – has been kind enough to invite me to speak and read from my book on Wed Dec 17 from 6:30P-7:30P. My first event went super well and I have more planned and hoped for in Tiburon (Mar 2) and Mill Valley and San Francisco (TBD). A Marin County, California father embarks on a journey to understand what led his seventeen-year-old daughter, Casey, to take her life. He travels back to her abandonment at birth and adoption from a Polish orphanage. His search leads to a condition known as attachment disorder, an affliction common among children who have been abandoned, neglected or abused. It explained everything. The Girl Behind The Door integrates a tragic personal adoption story with information from the experts to teach other families what the Brookses learned too late. Anyone who has lost a loved one to suicide. Anyone who cried through the movie Philomena. Anyone who knows us and wants to read our story. Available now on Amazon in print and Kindle version. Soon to be released on the Apple iBookstore, Barnes & Noble online, Sony Reader Store, Kobo and more. Our first image of Casey in April, 1991 came through another American couple who were in the process of adopting a 2-year old boy named Joseph (not his real name). He lived in the same orphanage as Casey did in Mrągowo, Poland. They snapped a couple of pictures of her while they received Joseph, pictures that we’ll cherish forever. We kept in touch over the years, sending Christmas cards and photos of our children as they grew from infancy to toddlerhood to middle school and high school. They lived in a rural area, were very conservative and devoutly religious. We lived in a famously liberal, affluent suburb outside of a world-class city. We were active in our local Episcopal church, but our connection was more social than spiritual. Every Christmas I’d share their cards and photos with Casey, re-explaining the nature of our connection. But as she reached her teen years, she reacted as most teens would – superficially. She poked fun at Joseph’s ears (poor kid did have elephant ears that stuck out) and sniffed at his involvement in church groups, scouts and his aspiration to become an auto mechanic. He was certainly not marriage material for Casey Brooks. 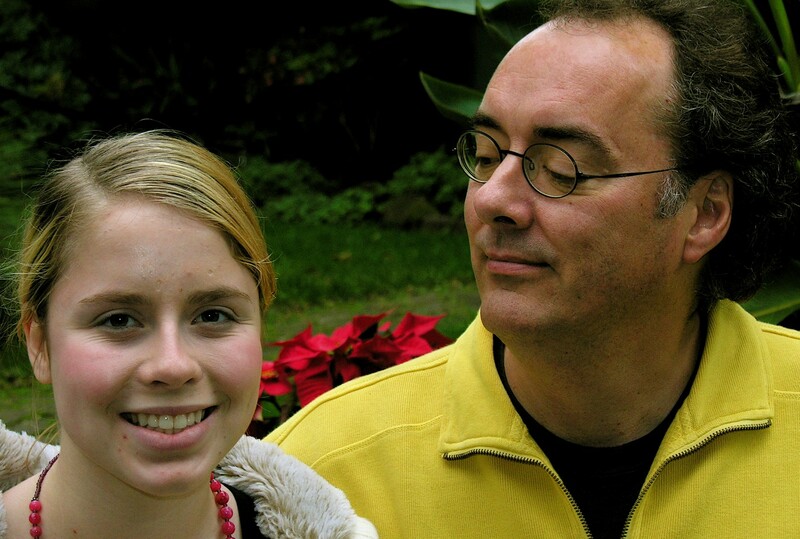 After Casey’s suicide, I tracked down Joseph’s father online; we’d lost touch. 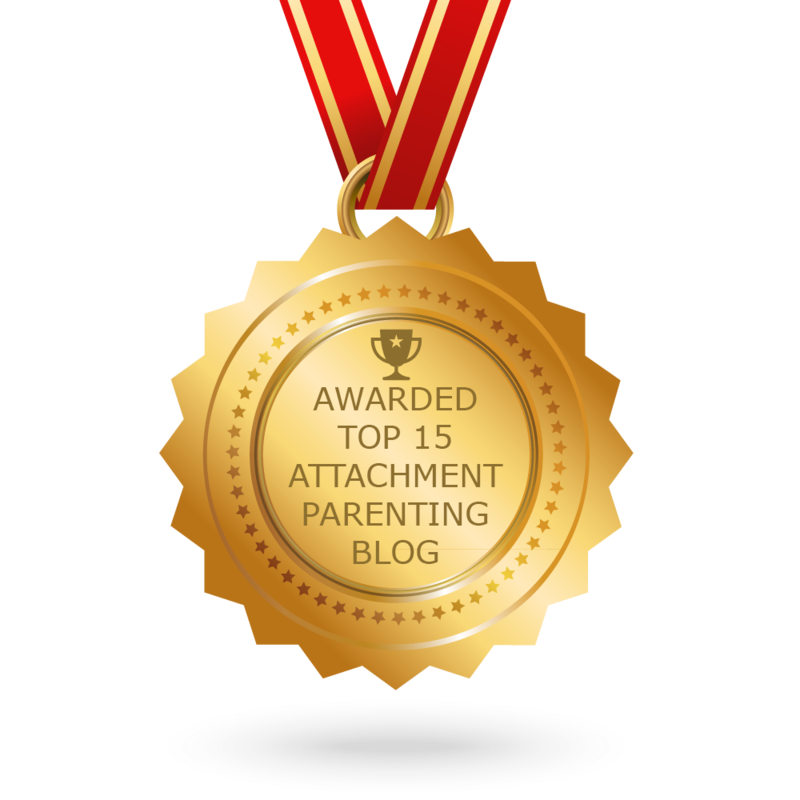 I wanted to break the tragic news to them but also wanted to know how Joseph was doing, especially in light of my discovery of attachment disorder. He was older than Casey when he was adopted from that orphanage. Surely there was emotional residue from his longer time there. I needed to understand more about Joseph’s life narrative since I knew so little about Casey’s. I emailed Joseph’s father hoping I’d get a reply, but “teen suicide” is a toxic subject and most parents slam the door shut. Joseph’s father did write me back. His response was both illuminating and unsatisfying. His life since then had been pretty normal, much like Casey’s. He adored his older brother and his dog, loved NASCAR and entered a training program in auto mechanics at the age of 22. His father admitted that Joseph had some learning disabilities and issues with his eyesight, but nothing like that rages and outbursts we’d seen in Casey. This left with me with a multitude of questions. Was his father being truthful with me? Were they in denial as I had once been? Did they even tell Joseph about Casey’s suicide for fear of freaking him out? Was the fact that Joseph had been at home for his first year rather than institutionalized a deciding factor (as adoption experts assert)? Was Joseph’s “older brother” a critical source of security for him? Should we have given Casey a sibling? Was her dog Igor not enough? Were Joseph’s parents simply better parents than we were? Were we just complete failures? Should we have been more conservative and devout? Would any of this have made a difference in whether Casey lived or died? Why would two children from similar circumstances go down such different life and death paths? These are the kinds of questions a grieving father grinds through every day for the rest of his life. Last week I wrote about Twinless Twins. Casey was a Twinless Twin but she never knew it. Her sister was stillborn and we never told her out of fear it would freak her out. But that wasn’t her only challenge when she came into this world on May 3, 1990. She wasn’t ready. Her mother went into labor six weeks early – week thirty. Casey’s birth weight was only three pounds. This is what a three-pound preemie looks like, her hand not much bigger than an adult thumb. But don’t worry. This little girl’s doing fine. Here she is at seventeen months. Casey probably went straight from the delivery room to an incubator, where she likely spent much of the next two months before she was sent to the orphanage in Mragowo. Who even knows if her mother ever held her? When my wife and I learned about Casey’s premature birth, we tried to learn everything we could, a task made difficult by the fact that this was 1991; we couldn’t just Google “preemie.” We were years away from a home computer. So we consulted an old high school friend who was a neonatal intensive care nurse. The long-term effects of a premature birth were terrifying: learning disabilities, vision and hearing problems, digestive and respiratory problems and cerebral palsy, among other things. And what we first learned about Casey at ten months did nothing to ease our concerns – she couldn’t sit up, stand, crawl, feed herself or do much of anything. Some people (who shall remain nameless) seeking to protect us, urged us to back away. But we couldn’t. We assumed there was a good chance she might have had CP. Best case scenario? She’d probably have developmental delays, learning disabilities or frail health. She might’ve been the smallest kid in the class. As concerned as we were for Casey’s future we’d already fallen in love with her, and then we saw her first image (at ten months). We couldn’t get to Poland fast enough. The bigger picture never dawned on us, and the doctors we consulted never brought it up – an unwanted pregnancy, traumatic birth, a dead twin, life devoid of human touch for two months followed by limited human contact in an institution for a year. That was Casey’s life before we even met her, but we brushed this off. Just love her enough and everything would be fine. The fact that Casey defied those odds to become the incredible human being that she did is either a testimony to her amazing willpower or to the basic survival instincts of children faced with impossible odds.